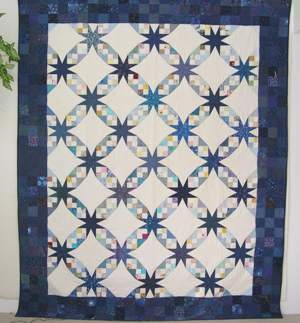 Visit My Quilt Gallery for New Quilting Ideas Through Quilting Pictures!!! If you need detailed information on a specific quilt please let me know. Welcome to my Quilt Gallery. I will be rotating my designs regularly so visit often. I will be giving away FREE ideas and patterns on a regular basis and I also sell my unique Quilt patterns. This quilt was on my UFO page as I was making it for my grand daughter - Mackenzie. Well I finished it in time for her first birthday!!! !We hung it on the wall in her bedroom. I think she likes it!!!! It was a must for my quilt gallery. Tequila Sunrise. Had to add this one it's also the cover of my Quilt ebook. 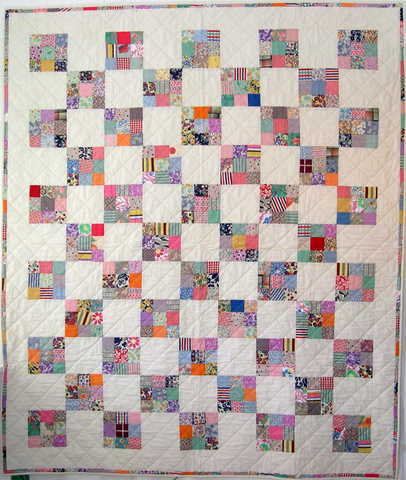 I had been admiring a similar quilt in a book and thought I might like to work with strips joined on the angle. The one I liked was all golds and looked so warm and comforting. So I decided to just pull some fabrics from my stash, and get on with it! Apparently I don't have many golds in my stash, but I love the reds and oranges! 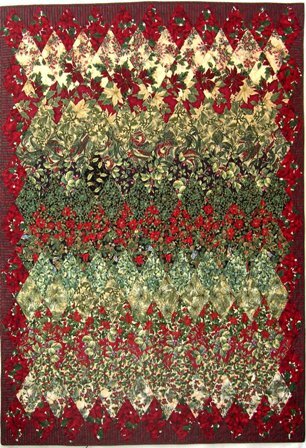 I seem to be in a red phase at the moment, so I'll just work through that and get it out of my system....more red quilts to come! I was so proud of my daughter when she went off to the University of Victoria. She worked hard and when she graduated I made her a quilt to commemorate the event. I made her a “Tennessee Waltz” Quilt because we both love stars. I called it “Star of UVic” because it is a star pattern and because it was for my “star” daughter. 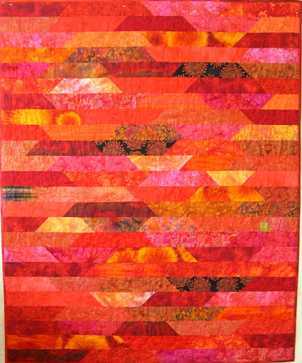 The Diamond Quilt - this is one of the classes I teach. They are so much fun to collect the fabrics for, as well as to put together. I have made 6 or 7 of these wonderful quilts in different colorways and this Christmas one is one of the nicest! I love how the colors flow. This Twisted Nine Patch is a great way to use up those scraps and turn them into something beautiful! 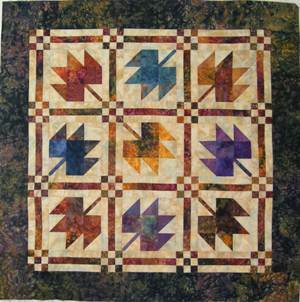 This is quick to make using strip piecing. Put together your 9 patches, then cut them up, twist them around, and sew them back together! 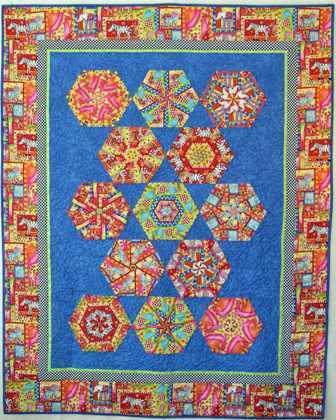 Pin Wheel Party Quilt - this is a bright fun quilt for a youngster. 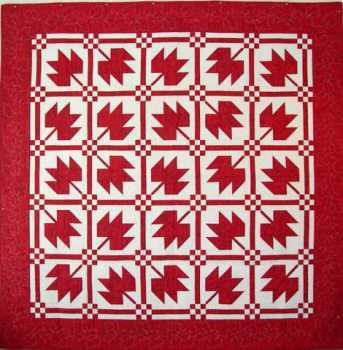 It is made up of pinwheel blocks alternating with plain blocks - what could be easier? 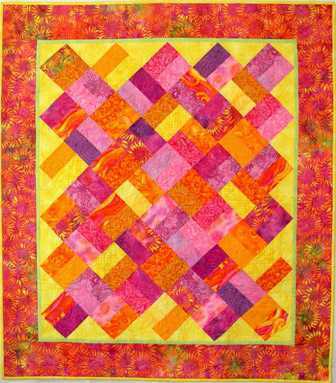 Stack & Whack Quilt: A must for my quilt gallery. This is where the fun begins! Stack-n-whack quilts are so much fun to put together because the result is such a delightful surprise! 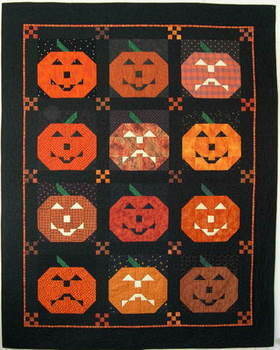 This one is made with Jane Sassaman fabric, but it looks great in florals, kiddie fabric, fish, halloween, you name it! Check back later for more of my stack-n-whack quilts. I'm addicted! It shows so well in my quilt gallery. This is a great book for ideas on Stack & Whack quilts by Bethany Reynolds. If you like Stack & Whack quilts this one belongs in your library. 13 Ring Circus Quilt - this is another type of Stack-n-whack quilt and this one was made with kiddie fabric. Romantic HeartsQuilt: This is one of my favourite quilts! It is so soft and soothing to look at, I had to include it in my Quilt Gallery - but then I love anything with hearts on it. 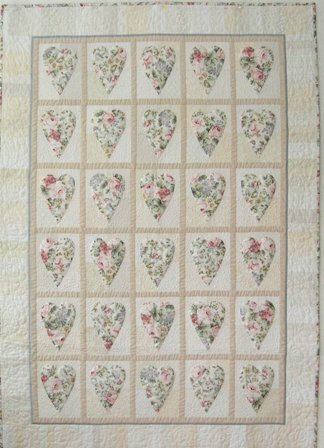 I pieced the backgrounds of this quilt to add interest, and kept the sashing soft so it doesn't overpower the romantic floral hearts. A soft blue inner border picks up the blue in the hearts, and the piano key border is made from all the different background fabrics. Using the same floral print for the binding pulls it all together! An extra layer of batting underneath the machine appliqued hearts gives them extra puffiness (a trapunto effect), especially when the backgrounds are stippled. Splash of Blue quilt in the quilt gallery. 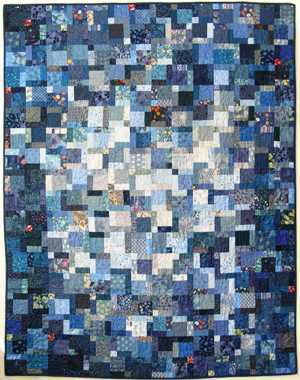 Splash of Blues Quilt: This simple quilt pattern made up of pairs of rectangles set on point is especially scrumptious done in blues and purples. The fabulous sunflower batik border marries all the blue hues well. I had a blast quilting the "blues" freehand with wild and crazy flowers and leaves! This quilt looks great hanging on my studio wall, but wouldn't it also be wonderful for a special newborn! 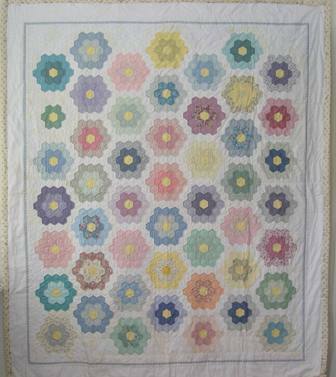 Mom's Flower Garden Quilt: I haven't counted how many hexagons I hand pieced, but I can tell you that it is A LOT!! I used to travel to visit my aging Mom, and always took a little bag of precut fabric hexagons as well as paper hexagons to baste them onto. Then when Mom and I had tea with the lol's (that's little old ladies)or waiting around doctors offices, I would whip out my little bag of hexagons! It was a great conversation starter, -- even the lom (little old men) would come over to ask what I was doing. Well, Mom passed away a couple of years ago (at the great age of 92!) and I figured I better get "Mom's" quilt put together. Because it is a lovely old fashioned kind of quilt pattern, I wanted to hand quilt it. So each and every little hexagon is quilted BY HAND 1/4 inch inside the seam line! I still have to quilt the border -- yikes, another UFO! Oh Canada Quilt!!! Now that's patriotic!!! I wanted to show my true colors on Canada Day, and came up with this arrangement of blocks. It has been very popular and had to be included in my quilt gallery! Can you believe this is the same pattern as the Oh Canada Quilt, above but with Fall colours? It's amazing how a pattern changes with different fabrics -- the batiks are gorgeous! 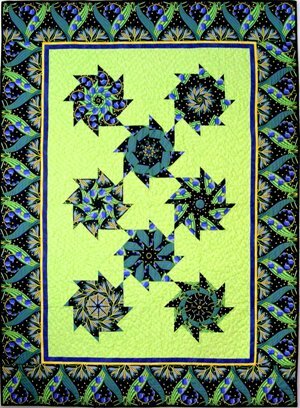 If you like this pattern, you can find it and lots of other fun quilts in Our Best Seasonal Quilts by Fons and Porter. 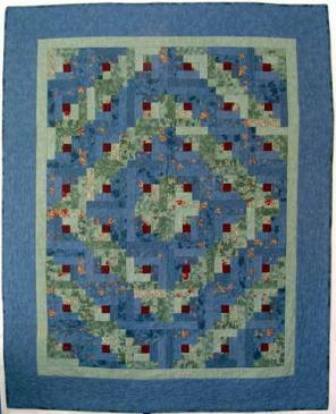 Woodsy Log Cabins Quilt: The Log Cabin is such a lovely traditional block, and the quilt goes together pretty quickly. I love blue and green together, and made the center square red to symbolize the fire glowing in the hearth of the cabin. How many Log Cabins do you have in your quilt gallery? I was playing with "on point" squares one day, and decided to cut them in half to see how it would look. I liked it, so here is the result. Way to perk up those dull winter days! I have done another one in a different colorway, come back and check it out later. I am soooooo drawn to old fabrics and quilts. I spied the colorful squares shown here in an antique store and had to have them. They were sewn into strips of little squares and I wonder what the quilter had in mind -- are these scraps of clothing her family wore, did she get tired of it or just ran out of time required to finish the project. I took the long strips apart and made them into Nine Patches so that I could "calm" them down with muslin squares in between. I quilted it simply, and called it "Thank you Aunt Anonymous". I don't know who this lady was, but I hope she likes the result! I just had to include this in my quilt gallery. Always label your quilts so that future generations know a little something about their creator. Finished Viewing My Quilt Gallery? Return "Quilt Homepage"